Does the poor young congresswoman not understand that the government does not produce anything to generate revenue? So if the government did take an equity stake in the Green New Deal, it would probably mean a tax increase to fund the investment. The photo with the commentary on the Green New Deal by Nick Loris is worth a thousand words. Rep. Alexandria Ocasio-Cortez stands in front of the cameras and microphones, bug-eyed and open-mouthed. She is spouting more nonsense about eliminating automobiles and shutting down the production of oil, natural gas, nuclear energy, and retrofitting every building in the country with solar and wind power. So this is socialism wrapped around, or rather inside of, global warming. Can anyone say for sure that the temperature will rise that much or only that much? The climate has been warming since the glaciers reached the terminal moraine, and it will continue with or without us until such time as it reverses and we head back down the slope to a frozen planet. Maybe we would be far better off investing our many trillions of dollars, and that’s what we are talking, not in chasing something we maybe can’t control but rather in moving populations to higher ground, which is something we can control. Just a thought. Wind power is not free. The maintenance costs are horrific. They last for only half of the assumed life cycle. Next time you drive by a flock of windmills, please take note of how many are not turning. The concrete base, 50 feet in the ground, generates tons of C02 just during manufacturing. Even “conservative” media is madly in love with Rep. Alexandria Ocasio-Cortez. Just count the number of articles complete with a photo of her over at Breitbart and The Daily Wire. The solution is simple: Plant trees. Lots of trees. Stop building skyscrapers, which act as a barrier to removing gases from the atmosphere. Turn the concrete jungle into a jungle. Stop deforestation and clean up the underbrush to reduce forest fires. Build with concrete panels, not wood. Use more aluminum studs in construction, recycle more materials for insulation, and turn plastic foam into synthetic wood. Every time I read something about Ocasio-Cortez, I have to ask myself: How can a college graduate spew out such nonsense? Socialism doesn’t work, especially in the USA. People attend colleges and universities to learn how to think and use logic to solve problems. I hope and pray that everyone sees Ocasio-Cortez for the airhead she is. Thankfully, House terms are only two years. Here is a major point: We have 250 million cars in the U.S. Under the Green New Deal, everyone will be forced to buy a new electric car, even those with hybrids, about $40,000 per car. During the Cretaceous Period (145 million to 66 million years ago), Earth’s average temperature was 73 degrees, compared to 60 degrees today. There were no polar ice caps and, in fact, the earth was covered to the poles in dense vegetation, which millions of years later we are taking out of the ground in the form of oil and coal. One item that is never, ever discussed related to green energy is that it requires energy backup. The energy backups are the classic power plants that are either coal-, petroleum-, or natural gas-fired. These backups are not turned off until required. They are always on, but at a low level to allow immediate switch-over. The truth is that atmospheric concentration of carbon dioxide is a result of changes in average global temperature, not the cause. Consider the history of ice ages over the multibillion-year history of Earth. If you want to convince people that your plan to solve a problem makes sense, offer a plausible plan. 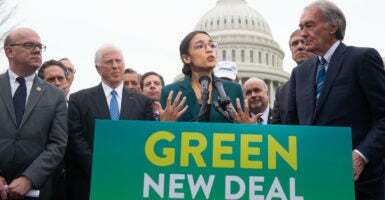 The Green New Deal is a sad joke, as Lee Edwards’ commentary shows (“There’s Nothing New About the Green New Deal”). It has zero percent chance of success, because it is insane. Destroying an economy and making tens of millions of people destitute for a tiny, if perceptible, gain is ludicrous. We are one of over 200 countries on Earth. No one is going to give up cars, trucks, buses, and planes. They’re not giving up eating meat. All of the people with money would leave, as would the multinational corporations, and with them goes most of the federal revenues. I’m curious how the Democrats are allowing this incoherent freshman congresswoman to be the point person for their Green New Deal initiative. Dear Daily Signal: My thought on Katrina Trinko’s article on the infanticide bill (“Senate Democrat Blocks Infanticide Ban”) is that life is a thermodynamic process that begins with cell division (which takes energy) and ends when the process stops at the end of physical life. Interrupting this process at any time is death—doesn’t matter if it two weeks or 90 years. Isn’t it a shame how much of a reprobate mind our government has developed? We murder living babies and abort viable babies yet within the womb who feel pain, hiccup, and kick as they await their birth. Yet without any feelings of remorse for those lost American citizens, our government officials will align themselves with those illegal immigrants who have no U.S. citizenship. Our officials want to open the borders and let in all of these people without any questions asked, no medical checkup, no history of their prior lives, even permitting children in without having vaccinations. Yet our own children cannot even enter our schools without current vaccination papers. We would have been able to maintain our own populations within the United States if we had not gone down this horrible road of destroying millions of babies since Roe v. Wade. Why bring in illegals when we could have our own citizens fill the jobs, colleges, Social Security payments to cover our elderly? Instead, we have opted to put these illegals on our welfare rolls, give them “free” health care, provide homes, and keep them in minimum-pay jobs to help big industry and agriculture companies. What a dirty shame.—Berdie Slater, Butler, Pa.
My thoughts on the “Born Alive” bill, the subject of Rachel del Guidice’s reporting: In a sane world, a mother would be the first and last line of defense for her baby at every stage of development before and after birth (“House Conservatives Seek to Force Vote on Bill to Protect Babies Who Survive Abortion”). In a sane world, abortion would be unthinkable. In a sane world, an unborn child would be valued for the precious life that it is. Abortion is every bit a sin and stain on this country as slavery was. Congress is guilty of legalizing this horror, but the real shame and guilt lies with women who embrace the so-called “right” to kill their own flesh and blood. When did we become so hard-hearted, so selfish, and so irresponsible, and our thinking so twisted? And why? We are in the grip of an evil mindset that is destroying us. In the name of “women’s rights,” we have given up our most sacred rights. We’ve turned innocent babies into inconveniences that can be legally destroyed. We’ve turned men and boys into objects of contempt and loathing. This cannot stand. There is nothing good in this. We must change our course. Our country’s very soul is at stake. Thank you for your voice.—Diana Lott, Santa Rosa Beach, Fla. I appreciate Rachel del Guidice’s fine article regarding bringing the “Born Alive” bill up for a vote in the House of Representatives. It was comprehensive, easy to follow, and clear. The media and lawmakers are missing the point. Once a child is born, he or she is a citizen of the U.S. and entitled to all the benefits of the Constitution, including life, liberty, and the pursuit of happiness. Babies born alive are entitled to these protections. If I’m not mistaken, even in the Roe v. Wade case the Supreme Court stated that once life is established, the fetus or baby would be so entitled. The Democrat Party has exposed themselves as the party of infanticide, along with a lot of other evils like tyranny. However, people who listen only to the mainstream media never hear about it. Thanks to Rachel del Guidice for writing about the abortion survivors bill (“How House Conservatives Are Planning to Force a Vote on Protecting Abortion Survivors”). Please do what you can to get this information to as many people as possible. I am sharing with whoever I can. This is the saddest display of humanity I have ever read about. How can this even be a question open for discussion? Dear Daily Signal: Like everyone else, I just want to know when Hillary Clinton, and even husband Bill, plus many others who were involved, will be charged with breaking the law (“Stonewalling on Clinton Emails Continues Under Trump, Watchdog Says”). As Kevin Mooney’s story suggests, there is plenty of evidence of specific laws broken, enough to at least impanel a grand jury. So let the process and facts unfold, plus keep up the pressure no matter who tries to bail them out or tries to shut down the process. The rule of law is on those administering and pushing forth with the facts. It is that simple. So what is the actual holdup? There is plenty of proof, so why is there even discussion? Any one of us who did even just a small amount of what these two and others have done would be locked up and the key would be thrown away. So we should all stop speculating about why, how, or when, but rather bind together, obtain a group of the smartest lawyers willing to take on this Clinton machine, and get it done. And no matter the consequences, or the moaning of the left, or how it tries to hide, cheat, or disrupt the effort. I believe a lot of members of the Democrat Party were right in the middle of it all, and we will never find any answers. It will be swept under a rug until 25 or 30 years from now. Dear Daily Signal: So Democrats don’t want to work on immigration issues and the southern border (“13 Fact Checks on the State of the Union Address”)? I have a way to change that quickly. Everywhere that is not a sanctuary for illegal immigrants, have ICE go after any and all here illegally. Start deporting every one of them, no matter what their criminal records might be, good or bad. Turn the heat up. No more government shutdowns with Americans going without paychecks. Have illegal immigrants deported in mass numbers, and tell the Democrats it will only get worse until they put forth real negotiations toward border security—legal status for the “Dreamers,” ending birthright citizenship for anyone born here by illegal parents. That was the finest State of the Union address I have ever heard, and I started listening with JFK’s first (“Here’s In-Depth Analysis of Trump’s Policy Proposals in State of the Union Address”). The congressional “resistance” led by Nancy Pelosi looked and acted like a bunch of spoiled-brat adolescents who just had their pacifiers taken away. The “ladies in white” were pathetic. Stacey Abrams, who gave the Democrats’ response to the State of the Union address, has an agenda (“Fact-Checking 3 Claims Stacey Abrams Made in State of the Union Response”). Voter suppression is a common call, when the reality we couldn’t get people interested enough to go out and vote. I wish more Americans would spend time studying the issues and then voting. There is plenty of opportunity to vote. Heck, Election Day is probably the day with the least turnout, since everybody already has voted. But voter suppression is one of those “dog whistle” issues that liberals trot out when convenient. No talk of that down in Broward County. The government shutdown occurred because Democrats have an agenda and it does not include any border security. They have promised since President Reagan did the amnesty and haven’t delivered. It is abhorrent that a liberal congressman would bring an illegal immigrant to the State of the Union. They should have been arrested. And how many laws have been broken by that illegal immigrant working here? Man up, liberals, accept the fact that you are a big part of the illegal immigration problem by not getting good immigration reform into place. The numbers of Americans who suffer from illegal immigrants—in terms of work and livelihood—is scary. For a measly $5 billion, Nancy Pelosi held the government hostage over ideology. She’ll spend that in airfare and perks over the next two years. And yes, the tax bill was rigged and many, many Americans are benefiting by it. Sorry, Stacey, all those jobs your hero, Obama, said weren’t coming back have started to return. Stacey Abrams should serve as a wake-up call for all Americans. President Trump’s accomplishments during his first two years in office would have fulfilled the values of both major parties over 40 years ago. Since the 1980s, both parties have acquired career politicians whose goals have been getting re-elected through the propaganda and financial support of special-interest groups. These special-interest groups are driven by a small portion of the country and gain political leverage through lobbyists and PACs. Abrams almost won the election in Georgia because of propaganda financed by out-of-state radicals. The same radicals were able to influence an election in Alabama a short time ago, but failed in their efforts in Texas against Ted Cruz. If the president’s supporters become complacent, this country will come under the control of Hollywood, LGBT activists, and illegal immigrants. The Constitution will be torn up and we will become a Third World country under the power of such honorable people as the Clintons, Obama, Waters, Soros, and the current batch of incumbent, radical idiots. Abrams and other Democrat hacks twist and turn the words and phrases to meet their agenda. Someday there will be an honest Democrat who will tell the truth and give credit where credit is due. I don’t know why the Democrats picked an election loser to give the rebuttal to the State of the Union address. Our president is doing the job we elected him to do. We are very proud of him and the speech. Most things that he has tried to do has Democrats trying to stop him in any way possible. It is really something how they vote for something one year and turn it down the next. Which brings me to our border wall and security. There is a crisis at our border—we need that wall. They all know we need that wall. They have been saying it for years. Now that Trump wants it, it’s immoral. I used to think I was a Democrat—thank God that Hillary showed me all about them. I am so shocked at the state of our nation. We all bleed the same. Dear Daily Signal: I read with interest Walter Williams’ commentary article featuring Tucker Carlson’s video regarding labor activist Cesar Chavez and his resistance to illegal immigrants who were crossing the U.S. border in those days (“A History Lesson on the Shifting Political Stances on Illegal Immigration”). When I met this produce industry veteran, he told me he created a new label for his employer’s lettuce during one of those strikes. Every carton of lettuce shipped by his company was distinguished by the “Union Lettuce” label, and the grower/packer/shipper went on hiring nonunion workers, or scabs, to work during the strike while successfully selling lettuce to produce buyers. It was a creative way to resist Chavez’s efforts to unionize the California lettuce industry while still being able to sell the company’s lettuce to buyers. — Ken Hodge, Pasco, Wash. 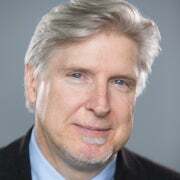 I disagree with Jonathan Zalewski in his commentary article, “Why a Bipartisan Bill to Federalize Animal Abuse Crimes Is Well-Intentioned but Wrongheaded.” Zalewski thinks animals deserve less respect than we do, like many people who believe that animals don’t have feelings or don’t deserve respect. Zalewski writes that he opposes animal cruelty becoming a federal law. The bill, called the Preventing Animal Cruelty and Torture Act, would make it a federal crime to crush, burn, drown, suffocate, or impale an animal or otherwise subject an animal to serious bodily harm, if those acts take place on federal property or affect interstate commerce. With all the anger against President Trump from D.C. politicians, especially the angry left, I wonder if it’s time for a commentary on what life in the White House was like for Democrat Andrew Johnson. Abraham Lincoln had asked Johnson to run as his vice president for Lincoln’s second term, and he quickly had to take over as president. Johnson was a Southern Democrat, but agreed with Lincoln’s plans to bring the union together. He received a lot of threats from Southerners and was even impeached, although he was determined to be guilty only of disagreeing with angry congressmen. All of this impeachment talk going on and the Democrats’ comments about Trump’s “unprecedented” efforts to “go around Congress” just seems to be par for the course with anti-president politicians.